The power of the Range Rover combined with the sleek coach-built ambulance body provide a new kind of high-speed casualty vehicle. The roadholding and cross country mobility produced by the four-wheel drive, special suspension system and rugged chassis needs seeing to be belived. 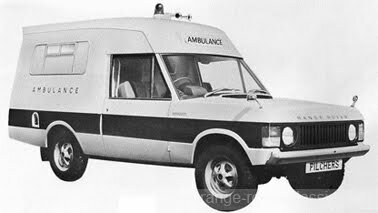 Add to this refined patient and driver comfort and the result is a new and unrivalled class of ambulance. Equipment can be supplied and modifications carried out to clients' requirements.